NCM-055 - AC-30 Rigid Stand with "Bent Pins"
Music will not be producing anymore. None are left, not even blems or seconds. 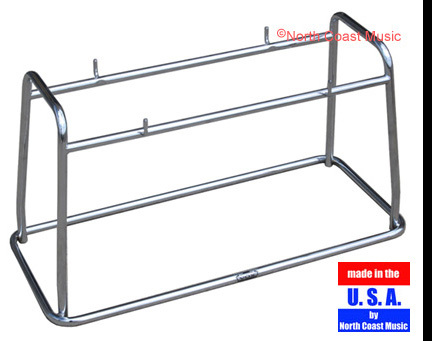 Accommodates cabinets ~20" to ~21" tall. This stand measures ~16"(~40.64 cm) from where the caster touches the floor to the center of the hand wheel. May also be used as a functional replacement for the Vox Viscount. Many 1960s era Vox AC-30 amps came with factory predrilled holes to install this stand. 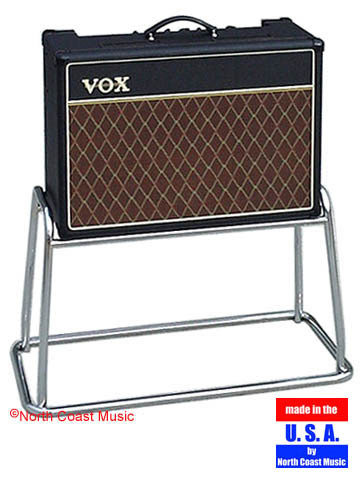 Vox licensed AC-30 cabinets made by North Coast Music also come predtrilled for this stand. If you wish to install this stand on a later AC-30, you will need to first dissemble the amp and predrill screw holes for the side swivel mounts. Neither mounting screws, a drilling template or instructions are included. This is a discontinued item. 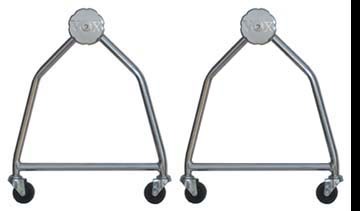 As of about twelve pairs of swivel side stands remain in stock. Once these have sold, we will no longer be offering this swivel stand.